With grass-fed beef popping up on menus across North America, and more small-farm owners venturing into this growth area, the time is right for a comprehensive book on how to raise, manage, and market grass-fed cattle. 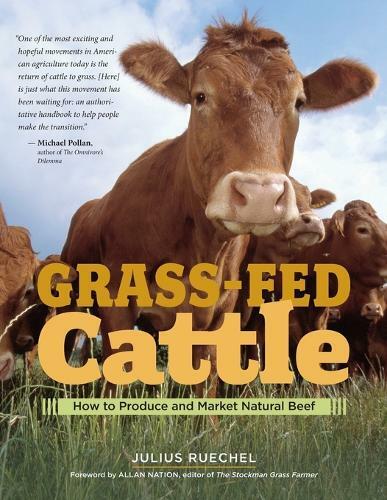 "Grass-Fed Cattle", the newest addition to Storey's library of best-selling livestock books, covers every aspect of raising and care, including herd selection, breeding, yearly cycles, cultivating and maintaining healthy soil and grass, fencing and pasture rotation, winter grazing, pests and diseases, and necessary equipment. Author Julius Ruechel, who has been raising beef cattle on his family's farm since his start as a 4-H member, packs this handbook with every thing a farmer needs to know, regardless of herd size and acreage. His advice and systems are applicable to the smallest backyard hobby farms as well as the largest commercial herds and ranches. In addition to essential farming information, Ruechel devotes a major section of the book to marketing. He discusses niche market opportunities, scheduling the selling and buying of cattle for the greatest profit, finishing the beef and arranging for slaughter, labelling, dynamic marketing, and financial planning and record keeping. He also includes chapters specially addressed to the conventional farmer who is transitioning to natural production, the farmer who is considering leasing or buying land, and the farmer who wishes to pursue organic certification.